/Mailing Service /Can I schedule my Mailing Service? Yes, you can pick a specific date, up to one month in advance, for your order to be mailed from our facility. 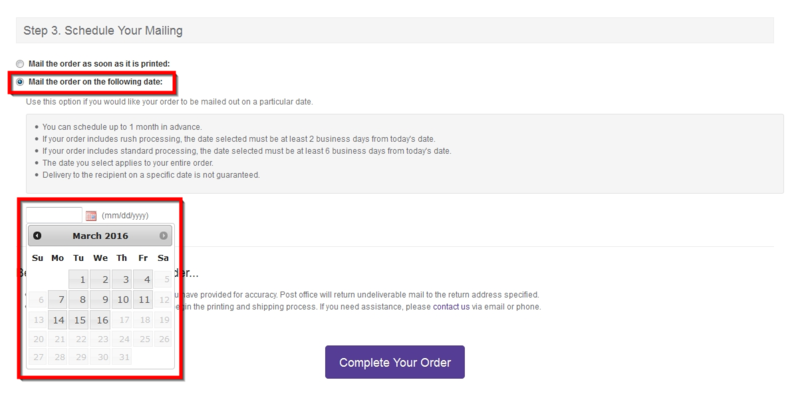 The available date options depend on the processing speed selected for your mailing service order. Please note that the date you select must apply to your entire order and delivery to the recipient on a specific date is not guaranteed. Learn more about Mailing Service here.